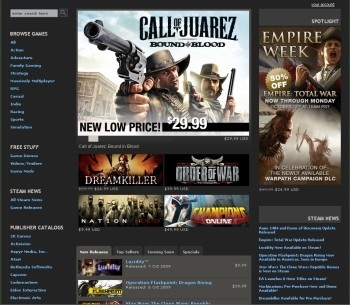 2009 was a good year for Valve's Steam service, as its membership grew to 25 million members. Valve has seen its digital distribution platform grow at an unprecedented rate in 2009, breaking records for both the total number of active accounts and the number of concurrent users. This past year saw the Steam user base grow to over 25 million active accounts, an increase of 25% over the previous year, with the total concurrent users hitting the 2.5 million mark in December, pushing the average number of monthly player minutes to over 13 billion. "Steam turned five years old in March 2009," said Gabe Newell, president of Valve. "With the introduction of each new platform feature released over the years - such as the Steam Community, Steam Cloud, and Steamworks - we've seen corresponding growth in account numbers, concurrent player numbers and developer support for the platform. As such, we plan to continue to expand and grow the platform to better serve the developers supporting the open platform and millions of gamers logging in each day." With Steam handling the PC version of Modern Warfare 2, it's not much of a surprise that the numbers have grown significantly, and as the service is pretty much synonymous with buying games digitally on the PC, the growth isn't going to stop in 2010.